The Mentone Hockey Club is pleased to offer Hookin2Hockey, the national junior development program designed by Hockey Australia. Hookin2Hockey is designed for boys and girls aged 10 and under, but our experienced club has adapted the program suit players of any age. Hookin2Hockey at Mentone Hockey Club gives young boys and girls the opportunity to learn the basic skills of hockey, develop fundamental motor skills and make friends all while beginning their lifelong love of hockey. We do need parents to complete an Expression of Interest form for the Come and Try sessions. Only do this if you haven’t already registered and paid for the kit. We will have sticks available that can be used for the session. We believe that Hookin2Hockey Skills in Action will introduce new players to a game that provides fun, friendship, and a lifelong love of an iconic Olympic sport, in a club/association based environment. The seven-week program will teach participants the basic skills giving them the opportunity to not only fall in love with our game, but providing them with a dream that one day they can represent Australia, whose teams are among the world’s best, at the highest level, the Olympic Games. 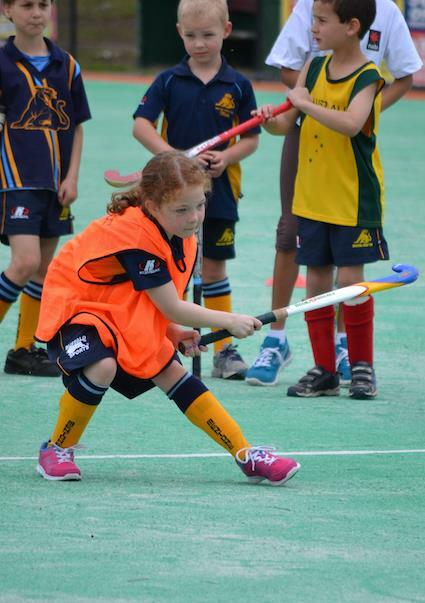 At Mentone Hockey Club, participants have up to three options for Game On! Mentone Minkey Little League – primarily for u6 to u8s and those who need more time to build confidence, held on Sunday mornings at our ground (continuing on from Hookin2Hockey). Southern Sharks intra-club – held in conjunction with several local clubs, is aimed at the u10s age bracket. This has traditionally been held on Saturday mornings. Hockey Victoria regional & metropolitan competitions – in full club uniforms and full-field, for u10s to u18s. Irrespective of whether a participant has progressed through other Hookin2Hockey programs, Game On! allows further development of fundamental hockey skills, as well as game based learning through modified matches. Mentone Hockey Club is well established at delivering Hookin2Hockey, having offered it over a number of years, providing over 350 kids a peek at the game. We are also highly regarded for pioneering a local path for kids to continue. In recent years we have run a local (at our home ground only) Minkey Little League, before kids opt into the district and metropolitan league starting from under 10s age group. Our Hookin2Hockey and subsequent GAME ON! sessions provides children aged 5 to 12 with the opportunity to learn the basic skills of hockey and game play, building their confidence to join the game. Note – we are certainly interested in those aged 12-18, but will introduce them directly into the junior section pre-season development programs. A core principle our program holds is 1 senior coach per 10 participants – to best ensure a quality experience. And who knows, they might just discover the next Jamie Dwyer of the Kookaburras or Mentone’s very own Tegan Boucher recently returned from the Indoor World Cup representing Australia in Germany. Week 1 is Step 1 / Come and Try. From Week 2 onwards, you must be fully registered. To “Come and Try” only, still requires registration. In this case, please select “Register Interest”. Registration to Hookin2Hockey is simple. Visit the registration page HERE and choose the “Hookin2Hockey 2018” option. The kit is designed to lower the entry price to playing hockey. It includes equipment necessary to playing – a stick, junior ball, shin pads, reversible top and backpack. It also includes fun stuff – see the options below. As of 1st January 2018, all registered participants will receive a Participant Pack delivered directly to their nominated postal address (rather than via Mentone Hockey Club. Participants are encouraged to pre-register for their local program at least 1-2 weeks in advance of the first session to ensure that packs are delivered on time. Once a participant registration to a Hookin2Hockey program is complete, the selected participation pack will be dispatched within 24 hours and sent directly to the nominated postal address on the registration. Please allow 5-8 business days for equipment to arrive. (see http://www.hookin2hockey.hockey.org.au/Participant-Pack) for more information. Feel free to contact our Hookin2Hockey coordinator – Steve Quenette by email: hookin2hockey@mentonehockey.org.au or phone: 0438 558 275.